If you love minerals, you will appreciate this. 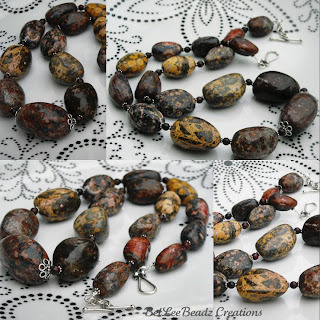 Gorgeous, rich tones of brick, English mustard, oak, russet and splotches of red can all be found on these chunky jasper nuggets. Largest centerpiece measures approx 3.5cm, little daisy s/silver spacers between round red jasper beads and ending with a s/silver toggle. Approx 22" this would look really spiffy against shades of sand/camel/buff.